Background: A number of novel fluorinated 4,5-dihydropyrazolo [4,3-f][1,2,3] triazolo diazepines (9-11) have been accomplished starting from 1-phenyl-3-trifluoromethyl pyrazole-5-one (3) in a multistep synthesis. Thus obtained compound 9 was converted into corresponding 5-aryl / alkyl fluorinated 4,5-dihydropyrazolo [4,3-f][1,2,3]triazolo diazepinones 10a-j and also 3,5-diaryl / dialkyl fluorinated 4,5-dihydropyrazolo [4,3-f][1,2,3]triazolo diazepinones 11a-c and all the compounds 9-11 were evaluated for in vitro cytotoxic activities. The outcome of the study showed that compounds 9, 10c, 11a showed very promising activity against MCF7, HeLa, Neuro2a and A549 cell lines. Further, compound 10g showed good activity against HeLa, Neuro2a and A549 cell lines whereas 10f and 11c showed good activity against A549 cell line. Methods: Synthesis of 1,4-benzodiazepines considered as privileged structures owing to their pharmacological, medicinal and clinical importance. Among the 1,4-benzodiazepine heterocycles 1,4-benzodiazepin-5-ones are well recognized for their wide range of biological activities. In view of the biological importance of 1,4-benzodiazepines, more specifically when fused with different heterocycles i.e. 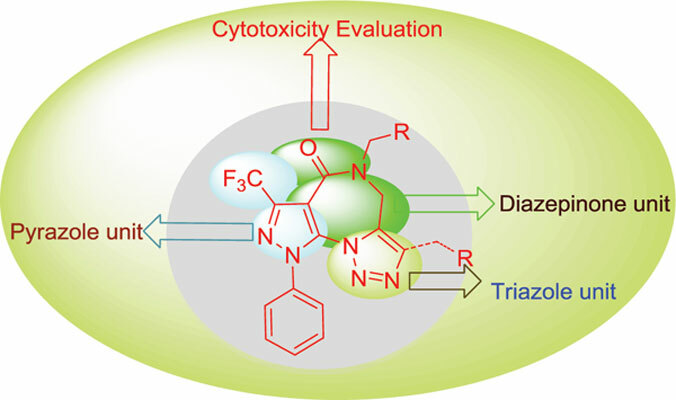 pyrroles, imidazoles, triazoles and pyrimidines, we envisaged the construction of tricyclic 1,4-benzodizepinone ring system having pyrazole and triazole units may become better candidates from cytotoxicity point of view. Because, pyrazole and triazole compounds gained enormous interest owing to their broad spectrum pharmaceutical and therapeutic applications. Additionally, it is well documented that presence of a trifluoromethyl functional group in an organic molecule at a specified position can lead to profound changes in physical, chemical, and especially biological properties of the molecule. With this background we accomplished synthesis of a number of novel fluorinated 4,5-dihydropyrazolo [4,3-f][1,2,3] triazolo diazepines starting from 1-phenyl-3-trifluoromethyl pyrazole-5-one in a multistep synthesis and evaluated for in vitro cytotoxic activities. Results & Conclusion: A series of novel fluorinated 4,5-dihydropyrazolo [4,3-f][1,2,3] triazolo diazepines (9-11) have been synthesized in a multistep synthesis and all the compounds were screened for in vitro cytotoxicity against a panel of different human tumor cell lines. The outcome of the study showed that, three compounds 9, 10c and 11a showed a very potent activity and the data is helpful to further exploit these compounds for anticancer activity mechanistic studies and also helpful to design and synthesize more such derivatives in order to take-up for further studies. Keywords: Pyrazole, triazole, diazepines, 1, 3-dipolar cycloaddition, tricyclic diazepinones, cytotoxicity studies. Keywords:Pyrazole, triazole, diazepines, 1, 3-dipolar cycloaddition, tricyclic diazepinones, cytotoxicity studies. Abstract:Background: A number of novel fluorinated 4,5-dihydropyrazolo [4,3-f][1,2,3] triazolo diazepines (9-11) have been accomplished starting from 1-phenyl-3-trifluoromethyl pyrazole-5-one (3) in a multistep synthesis. Thus obtained compound 9 was converted into corresponding 5-aryl / alkyl fluorinated 4,5-dihydropyrazolo [4,3-f][1,2,3]triazolo diazepinones 10a-j and also 3,5-diaryl / dialkyl fluorinated 4,5-dihydropyrazolo [4,3-f][1,2,3]triazolo diazepinones 11a-c and all the compounds 9-11 were evaluated for in vitro cytotoxic activities. The outcome of the study showed that compounds 9, 10c, 11a showed very promising activity against MCF7, HeLa, Neuro2a and A549 cell lines. Further, compound 10g showed good activity against HeLa, Neuro2a and A549 cell lines whereas 10f and 11c showed good activity against A549 cell line.